As with previous years, 2014 started with a New Years day dawn shoot. I’ve photographed the first dawn of the year for the last five connective years -with only one washout during that time. Below is a walk-through (month by month) of the images I’ve captured and produced during 2014. Sunrise at Currumbin on the Gold Coast with Martin Canning. This year I meet up with Martin Canning at Currumbin Beach on the Gold Coast. This was my first January 1st dawn shoot with my new Fotoman 617 film camera, & also the first for Martin –both of us bought our cameras mid way through 2013. The sunrise was nice, we both managed to capture a few frames (and a few outtakes). The film sat in the fridge for a few months – this was a new experience for me, considering the occasion, I always like to publish my New Year dawn images on the 1st, but because this year, I had only shot film I was not able to share the images until after Australia Day. During the course of 2014 I became ‘tuned’ and more accustom to my new found slow & patient form of image making. In late 2013 a bush fire broke out on North Stradbroke Island, the fire burnt for over a week and was still burning well into 2014. The fire was mostly under control and well contained by the local fire service, and no homes were lost. Smoke from the fires drifted towards Brisbane which resulted in some amazing sunsets. Cleveland Point (Right) was captured just as the sun was setting as the smoke haze drifted towards Brisbane. Late in January (Australia Day). I spent Australia Day the day on the Gold Coast, but this time with family, and at the beach. I was hoping to capture an iconic image of beach-goers celebrating Australia Day. I shot a few frames. Main Beach (Right), summed up the day. I especially like the beach umbrella on the left side of the image, an iconic feature of any Australian beach. More clouds would have been nice, but you take what you get. February was a slow month with no film shot. March was a slow month with no film shot. David de Groot and I hosted a few Autumn Tour workshops (via our Grasstree Photography company). During one of the earlier trips we were treated to some great light while at the top of Mt Mackenzie. Granite Moonrise: (Right) Golden afternoon light warms up the granite boulders as the moon rises high above Tenterfield in the New England Highlands. I had to run up this hill three times before capturing this image -each time I’d forgotten something, my viewfinder & then my film! Final Farewell (SS Dicky): (Below) In late April news had spread that the SS Dicky shipwreck in Caloundra was scheduled to be removed from the beach which bears its name, Dicky Beach Caloundra. The SS Dicky as the sun sets over Caloundra on the Sunshine Coast. This capture is most likely my last image of the SS Dicky as the wreck is being removed (by the Sunshine Coast council) from Dicky Beach very soon. The wreck has changed so much over the last few years. Visit my SS Dicky Tribute Page. In early May David de Groot, Mel Sinclair and I spent a night in Uralla with plans to capture a nice foggy sunrise of the famous Gostwyck Chappell. The sunrise was a washout but we did capture some nice light at popular Autumn locations on the trip down. Ghost Tree: (Right) is one of my all time favourite film captures from 2014. Taken mid afternoon while passing through on the way to Gostwyck on 3rd May 2014. Patches of snow made ground near Ben Lomond village, north of Guyra, on the morning of 4th May 2014. Golden: (Left). Long shadows and soft afternoon light create drama in the New South Wales countryside. Days of heavy winds caused the leaves of the Poplar trees to fall early, covering the driveway in gold. Tenterfield is an attractive country town with many historic buildings dating back to the mid-19th century. Surrounded by national parks and vineyards, it is also known for its autumn colours. Tenterfield Park (Left) & Tenterfield Tree (Below) were both captured on the same morning. Tenterfield Tree (Below) is the film version from a shot I’d captured the previous year I love the soft pleasing colours seen in the park during Autumn, Fuji Velvia 50 film brings it out nicely. Tenterfield Park took me a while to capture, I setup and then had to wait about 20 minutes for the sun to break through the overcast clouds. One frame, 20 minutes. June was a slow month, with no real shoots taking place. However I did celebrate my 31st birthday. I had hopped to get out to capture some of the cold starts and foggy mornings, but I didn’t find the time. South East Queensland was coming to the end of one of the coldest winters in recent memory. Martin and I decided to capture some frost, so we headed out to Ripley and shot a few rolls. Sunburnt Land (Right) A welcoming sight. Watching the morning sunlight with anticipation, knowing that the golden glow will warm my frozen hands after a -2 degree start to the day. Frosty morning light. There was still a bit of fog around come August, so Steven Fudge and I headed out west to Lake Moogerah to see what was on offer. Fog (Below), and Mt. Greville (Below) were both captured on the same morning. Mount Greville is a cone-shaped and deeply fissured mountain in South East Queensland, Australia. The mountain rises 720 m above sea level and is part of the Moogerah Peaks National Park. It lies approximately 100 km south west of Brisbane just outside the town of Boonah. An early start & a foggy morning in Lake Moogerah. This view presented itself as we drove towards the Governors Chair lookout. The light lasted for about five minutes, just enough time for one frame. I had left my light meter at home, so I used my Canon 5D MKII and took a light reading, I metered for the highlights -a few months later I was please to see the image on the light table. During the 1995 drought, Lake Moogerah dam levels declined to a low of 1% total capacity. The dam reached 100% capacity due to rainfall associated with the 2010–2011 Queensland floods, with water flowing over the spillway for the first time since 1991 on 6 December 2010. The two previous full moon rises had both been ‘no shows’ so when the conditions were looking suitable for late August I convinced Stef and Martin to drive south together to Hastings Point. The full moon rose exactly where I thought it would, but the bright sunlight caused me to miss it kissing the horizon. As we were packing up I decided to setup and capture a long exposure overlooking the headland. Stef was my walking light meter. f16 @ 2min, 1o seconds with no center spot filter. September was a quiet month. I didn’t get out at all for any shoots, but there was 5 rolls sitting in the fridge waiting to be posted to the lab in Sydney for processing. 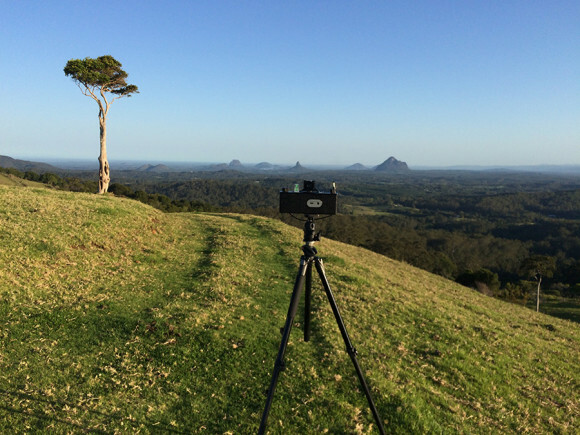 Martin and I drove up to Maleny in early October. The plan was to scout for autumn locations, we made the most of the conditions and came away with a few decent shots of the famous tree that overlooks the Glasshouse Mountains. Maleny Fire: (below) was an image that just kind of happened. I had seen images of this tree many times previously -mostly taken by wedding photographers, I had a fair idea where this vista was located (based on the view overlooking the Glasshouse Mountains), so when I decided to spend the day scouting Maleny with Martin Canning, I knew there would be a chance we’d end up shooting this location at dusk, all we needed was a good sunset! November was mostly a slow month, but I did manage to get out and capture a few images. On a stormy November morning I walked along the beach and came across the Noosa Surf Rescue boat. The sun was still shining through a break in the cloud which allowed me to capture a very moody and contrasty scene. Lifesavers patrol Noosa beach on weekends and public holidays from the start of the September school holidays until the May Day long weekend each season. December was busy with other work commitments & Christmas planning. I received a order of film & also spent time scanning the 5 rolls of processed film recently returned from Sydney. 2014 was a busy year, but also very slow going with only a handful of new images added to the collection. The slow pace is a byproduct of the slow and patient process required when shooting medium format film. In 2015 I plan to shoot a lot more & also hopefully travel to new and exciting locations. I’m also keen to re-visit favourite other locations and strive to capture new images on film with new eyes. I’d appreciate your comments & questions regarding 2014 and my plans for 2015. Please login & and reply below. Bring on 2015. Excellent round up of your year Kane! Sorry it’s taken so long for me to get to your blog again. As always, beautiful images. I’m hoping to get out more in 2015 now that I’ve had both shoulders, both knees & my foot operated on!! Thank you. Yes, hope to see some new images from you soon. Enjoy the year ahead. Thank you for your support during 2014 & prior. All the best for you and family for 2015. I’m looking forward to 2015 and venturing out some more. I think the slow process of shooting film isn’t necessarily a bad thing as it allows you to make sure you shoot in the best conditions. Thanks Martin. I love the slow process of film capture! and being able to walk around with my viewfinder is priceless ! !